 Investigator of intelligence brigade at Abu Ghraib to be replaced with senior officer. he officer who appointed the original investigator of prisoner abuse at Abu Ghraib is removing himself from the process so a new investigator can question him, a senior Pentagon spokesman said Thursday. Lt. Gen. Ricardo S. Sanchez, commander of ground forces in Iraq, asked his superior, Gen. John Abizaid, to recuse him as the overseer of the investigation, deputy Defense Department spokesman Bryan Whitman said. In a memo Monday, Abizaid, commander of U.S. forces in the Middle East, forwarded the request to Defense Secretary Donald H. Rumsfeld. Abizaid also asked Rumsfeld to find somebody new to spearhead the investigation of intelligence practices at Abu Ghraib prison. The memo was not publicly released. The appointment of Maj. Gen. George R. Fay as the intelligence inquisitor has drawn fire from critics who claim he lacks sufficient seniority to follow the trail of responsibility wherever it may lead up the chain of command. An Army reservist who sits on the board of an insurance company in civilian life, Fay is a two-star general. Sanchez, who put Army intelligence in charge of prison operations while the abuse was happening, is a three-star general. Although a two-star general can question a three-star general, it isn't practical, Whitman said. 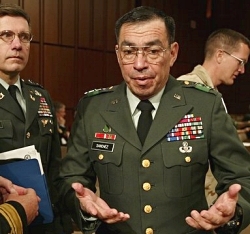 Sanchez is the officer who appointed Maj. Gen. Antonio Taguba, another two-star general, to investigate the activities of the military police brigade at Abu Ghraib. In his report, Taguba wrote, "I totally concur with Lt. Gen. Sanchez' opinion" about the performance of brigade commander Janis Karpinski, the one-star general Sanchez blamed for failing to keep prison guards under control. Taguba recommended a second inquiry to determine the culpability of military intelligence personnel, including John B. Israel, an Iraqi-American translator from Canyon Country. Sanchez appointed Fay in April to lead that second investigation, which is now under way. This week's decision to replace Fay and remove Sanchez from the loop is intended to ensure "a complete, thorough and transparent investigation" that will "stand up to the veracity that we want it to," Whitman told The Signal. Fay is said to be well along with his inquiry, which is one of 11 Defense Department investigations that have been or are being completed. Replacing him now could mean the results could take longer, although there is no deadline, Whitman said. The new investigator could pick up where Fay leaves off or start all over, Whitman said. The new investigator could be either a four-star general or a three-star general with more seniority than Sanchez. "There aren't a lot of three- and four-star generals to go around," a Pentagon official said. Although it will be up to the new investigator, Fay will likely remain part of the process in a junior capacity because of his experience with the case, Whitman said. Rumsfeld will act soon to remove Sanchez from the role of appointing officer, and Sanchez' replacement will appoint the new investigator, officials said.